Running during the summer doesn't have to leave you feeling like a hot mess. While there's not much you can do about rising temperatures, humidity and the heat index, you can arm yourself with strategies to cope with running in the heat so you don't chuck the habit all together until it cools down in the fall. Unless you are training for an event that takes place in the daytime heat, avoid exercising from 10 a.m. to 3 p.m. It's the hottest part of day. Generally, the early morning is the best time to work out, especially if it's going to be scorcher that day. It takes about two weeks for your body to adapt to the heat and cool itself more efficiently. Slow your pace and reduce your intensity and get the run in rather than pushing through it. Doing so will allow you to more efficiently acclimate and continue to run. Your body will gradually become better at cooling itself in the warmer weather allowing you to continue to run at your normal pace. Heat cramps are cramps in the muscles that occur during and after exercise. They are caused by a loss of water and electrolytes and an accumulation of lactic acid in the muscles. Leg muscles, like the calves or quadriceps, are affected the most, but abdominal cramps can also occur. To prevent heat cramps, drink plenty of water and/or sports drink before, during, and after exercise. People who are hydrated and are acclimated to hot environments are less likely to experience heat cramps. If you do get heat cramps, stop running, drink water and/or sports drink and massage the affected area. When the cramps are gone, you can resume running, but slow down. Cooling occurs when sweat evaporates off the body. To achieve this, the body diverts blood to the skin to cause sweating—this means less blood is carrying oxygen to the exercising muscles. In this way, the body reduces the amount of blood available to enhance performance. When conditions are above 69 degrees Fahrenheit, even well-acclimated runners should expect slower race times. After calculating what pace you think you can manage at a given temperature, run about 2/3 of the race at that pace and then if you are feeling good, you may increase it a bit. Wear light-colored, loose fitting clothing to deflect the sun's rays and allow your body to cool itself. Experiment with your apparel based on your climate. The runners in the Badwater 135-mile ultramarathon desert race wear white long sleeve wicking apparel and hats or visors with a tail to block the sun on their neck. Runners who train in humidity wear fewer layers, lots of sunscreen and wicking materials. Visors allow the heat to rise from your head while blocking the sun from your face. UV-rated sunglasses protect your eyes, and water- and sweat-proof sunscreen prevents sunburn. The key is to keep cool any way you can, and find the apparel that works best for you. 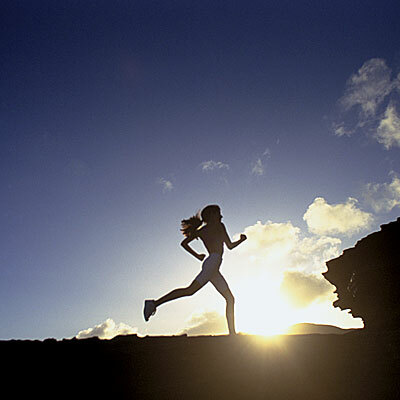 In 2007, the Archives of Dermatology reported that runners are at a higher risk of developing skin cancer than nonrunners. Researchers found that the occurrence of skin abnormalities increased with mileage, not only because of increased sun exposure, but perhaps because training can suppress immune function, making the body more susceptible to the sun's ill effects. Another study named sweat as a contributor to UV-related skin damage; perspiration increases the photosensitivity of skin, which makes it more prone to burning. Before every run, put on a water- or sweat-proof SPF 15 lotion that shields against UVA and UVB rays, says Rodney Basler, M.D., past chairman of the American Academy of Dermatology's Task Force on Sports Medicine. Run in the early morning. The temps are not as hot and the air quality is pretty good. This is your best bet if your schedule allows for it. Run slightly further because you'll be going at a slower pace for a given effort / heart rate. If you wanted to run 7 miles at 9:00 pace, but you can only muster 9:30s or 9:45s, then extend your run to 8 or 8.5 miles. Just make sure you have means to stay hydrated and stay protected in the sun. Splitting tempo runs into intervals. Make that 6-mile tempo run into 3 x 2 miles or 2 x 3 miles with breaks in the middle to hydrate properly and get cool. Work on constant relaxation of all muscles and joints from head to toe. Wear a white, breathable baseball hat or sun visor to keep the sun off your face. Wear a sweat band to keep the sweat off your face and out of your eyes. Pour water on your wrists and the back of your neck. Drink lots of water if you're fueling with gels, etc. Sugars make your kidneys work harder, so they'll need plenty of water. Wear a technical T-shirt or running tank that dries fast, yet allows plenty of air to pass through. Do You Burn More Calories in the Summer? The number of calories you burn per hour is a function of how economically you run and how fast you run, both of which can be affected by temperature. Heat can hamper economy if it means feeling so bad that you start using poor technique. If the heat forces you to slow down, you'll cover less distance in an hour. This means that you would actually burn fewer calories per hour in the heat, though you would still be burning about the same per mile. Just remember: If your running economy is not being affected, you'll burn about the same number of calories in the heat. Heat Exhaustion usually develops after several days of exposure to high temperatures and inadequate intake of fluids. Heat exhaustion symptoms include heavy sweating, paleness, muscle cramps, tiredness, weakness, dizziness, headache, nausea, vomiting, and/or fainting. With heat exhaustion, a person's skin may feel cool and moist. Cooling off is the main treatment for heat exhaustion. Drinking cool, non-alcoholic liquids may help as well as taking a cool shower, bath, or sponge bath. If the conditions worsen or have not subsided within an hour, seek medical attention. Heatstroke is the most severe of the heat-related problems. Like heat exhaustion, it often results from exercise or heavy work in hot environments combined with inadequate fluid intake. Children, older adults, obese people, and people who do not sweat properly are at high risk of heatstroke. Other factors that increase the risk of heat stroke include dehydration, alcohol use, cardiovascular disease and certain medications. Heatstroke is life-threatening because the body loses its ability to deal with heat stress. It can't sweat or control the body's temperature. Symptoms of heatstroke include rapid heartbeat, rapid and shallow breathing, elevated or lowered blood pressure, lack of sweating, irritability, confusion or unconsciousness, feeling dizzy or lightheaded, headache, nausea, and/or fainting. If you suspect heatstroke, call 9-1-1 immediately. For years, Denise Jones puzzled over the best way to keep the competitors in the Badwater Ultramarathon cool. Finally, Jones—considered the "dean" of Badwater aid-station volunteers—came up with the answer: Lay a bandanna out in a diamond shape. Place a row of ice cubes in a horizontal line, just below one tip of the bandanna. Then roll it up "like a burrito," and tie it around your neck. "We've found that this is the best way to keep runners cool," she says. "It feels wonderful." Maintaining proper hydration levels and electrolyte balance is critical for optimal performance and safety when running in the summer heat. The most efficient way to rehydrate properly is to put back exactly how much fluid you've lost while running. Unfortunately, there are two major issues with generalized advice when it comes to hydration. First, different temperatures and humidity levels will drastically influence your sweat-loss rate. Second, every runner has their own unique sweat rate and will be impacted by weather in a different way. Humidity has a major impact on sweat rates (as I am sure you've noticed if you've done any running in muggy weather) because sweat can't evaporate to cool the skin off, which raises internal body temperature and produces more sweat. Therefore, it's critical that you factor humidity levels into your hydration strategy and not rely on general advice. Hyponatremia, or water intoxication, results when the sodium concentration of the blood falls too low due to prolonged sweating combined with excessive fluid consumption. Symptoms include dizziness, muscle cramping, confusion, and stomach bloating. Severe cases can lead to seizure, coma, and even death. Electrolytes are minerals that, when dissolved in water, break into small, electrically charged particles called ions. Present wherever there's water in your body (think blood, cells and cell surroundings), electrolytes regulate your body's fluids, helping to maintain a healthy blood pH balance, and creating the electrical impulses essential to all aspects of physical activity—from basic cell function to complex neuromuscular interactions needed for athletic performance. Do You Need to Worry About Electrolytes? How do runners know when they need to replenish their electrolyte levels? According to Katie Jeffrey, RD, if you're a casual runner who's eating a diversity of nutrient-rich foods and staying hydrated, you probably don't need to take special steps to replace electrolytes before or after you run. "A well-rounded nutrition plan provides most casual athletes with all the electrolytes they need," says Jeffrey. "But if you know you sweat heavily, run in hot temperatures, or if you run longer than one hour, start consuming a sodium-enhanced sports drink or tab an hour before your run, and then every 10 to 20 minutes throughout your run, depending on how heavily you sweat." Regardless of how hot or humid it is, our calorie requirements per hour remain pretty much the same. In fact, our body's ability to digest carbohydrates actually decreases in hotter conditions because blood is diverted to the skin's surface to cool us off, leaving fewer resources available for digestion. If you consume more calories than you can digest during exercise, those carbohydrates will linger in your digestive tract and actually inhibit the absorption of fluids. Not only will you not get the calories, but it will slow your rehydration efforts. A hydration strategy that separates rehydration and calories can eliminate the risks of over or under consuming. Replenish electrolytes with your hydration, and get your calories from a separate source. Get more running tips and advice with our guide.